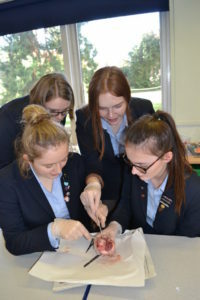 Hands-on science was the theme of this year’s Science Week at St Mary’s Senior School in Colchester, with a practical session in the labs every lunchtime from Monday 12 to Friday 16 March as well as many other exciting activities throughout the week. The week began with a visit from some pygmy goats and tiny bantam chicks, which the Year 7 students were invited to hold and ask questions about. Glenn and Claire from Blackwater Alpacas and Pygmy Goats in Braintree told the students all about the animals and Eliana Young, age 11 from Braintree had the chance to bottle feed one of the babies. “The goat drank her milk so fast!” she said! St Mary’s Head of Science Mr Vieito hosted a spectacular ‘explosions’ session on Monday, when students lit methane bubbles in their hands! The chemistry lab became the scene of a CSI investigation on Tuesday! 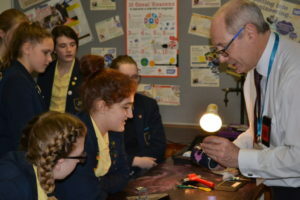 Royal Mail forensic scientist Mr Spore showed Year 9 students how to brush for fingerprints and then how to take their own, which they used to make keyrings. Year 7s also took part in a workshop provided by two coding experts from Signals, a creative digital learning provider and successfully programmed mini Microbit computers to play ‘rock, paper, scissors’! Miss Tew, Biology Teacher hosted a nature specimens quiz on Wednesday, which encouraged students of all year groups to identify and answer questions about some superb examples from the natural world. The Big Bang, UK Scientist and Engineers Fair, in Birmingham on Thursday gave Year 8 students the opportunity to examine pig organs from the ‘Operating Theatre Live’ exhibition; take part in virtual reality experiences; handle live insects; try to beat Usain Bolt’s record in a 10m sprint; and get up close and personal with some of the Royal Air Force’s jets. On Friday, the strong-stomached watched Biology and Physics Teachers, Mrs Murray and Mrs Chamberlain dissect eyes and hearts and then had a go themselves!